10 Gloucester is located on the west side of Gloucester, between Marlborough and Commonwealth, with 334 Marlborough to the north and 12 Gloucester to the south. 10 Gloucester was designed by architect John H. Besarick and built in 1872 by carpenter and building contractor Hiram A. Gerrish, one of a symmetrical pair (10-12 Gloucester) and one of four contiguous houses (334 Marlborough and 10-12-14 Gloucester), built for speculative sale. Hiram Gerrish is shown as the owner on the original building permit application for all four houses, dated June 4, 1872. Click here for an index to the deeds for 10 Gloucester. When subsequently he sold the individual houses, Hiram Gerrish included in the deeds a three foot wide easement across the rear of 12-14 Gloucester to provide access to the alley for 10-12 Gloucester. 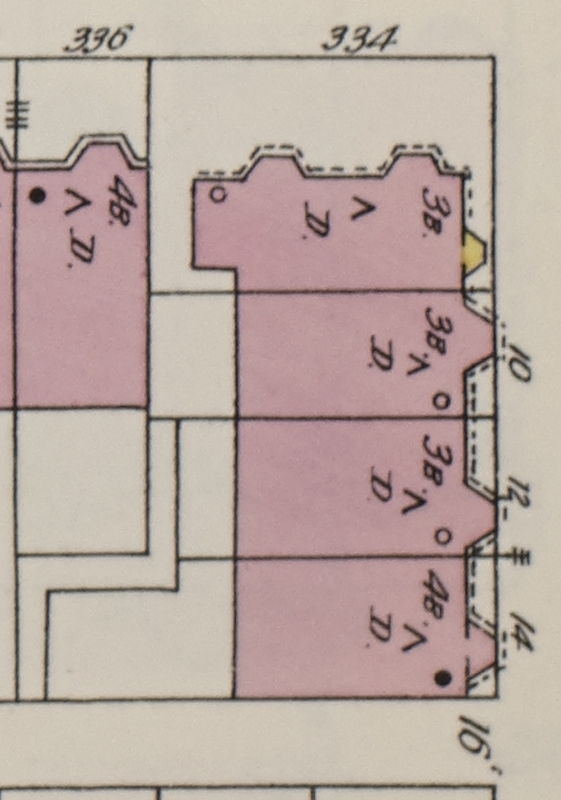 The portion of the easement across the rear of 14 Gloucester was increased to three feet six inches in April of 1879, and the further modified in December of 1882 to run across the rear of 336 Marlborough and then to the alley. On February 5, 1874, 10 Gloucester was purchased from Hiram Gerrish by Edwin Toppan, a real estate agent. He lived in Brighton. He purchased 14 Gloucester on the same day. On October 19, 1874, 10 Gloucester was purchased from Edwin Toppan by Horace Johnson Adams. He and his wife, Elsie Elizabeth Greene (Fielding) Adams lived in Lowell, where he was a furniture dealer. By 1877, 10 Gloucester was the home of mining investor Albert Smith Bigelow and his wife, Mary (DeFord) Bigelow. They had married in November of 1875, and their son, Horatio Bigelow, was born at 10 Gloucester in January of 1877. Prior to their marriage, he had lived at 76 Marlborough with his parents, Horatio Ripley Bigelow and Anne (Smith) Bigelow. 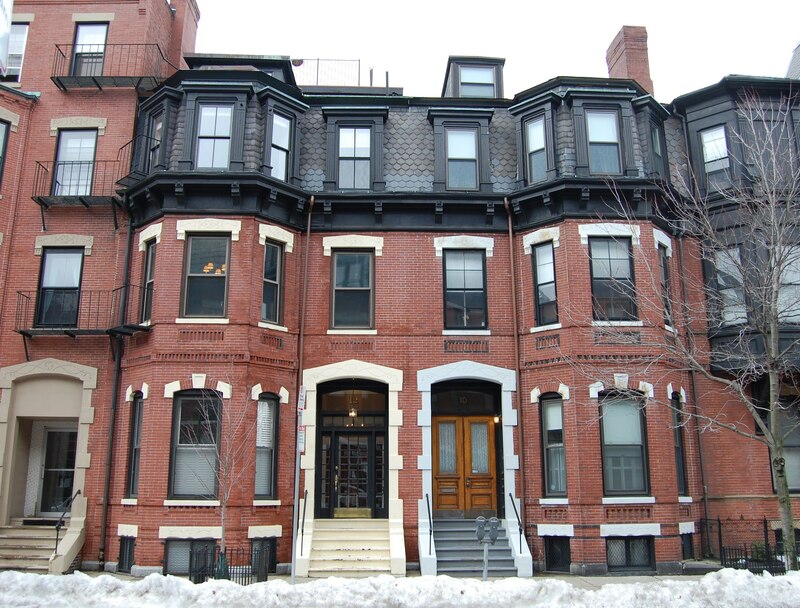 Albert and Mary Bigelow continued to live at 10 Gloucester during the 1880-1881 winter season, but had moved by the next season and were living at 30 Gloucester by the the 1882-1883 season. 10 Gloucester was not listed in the 1882 Blue Book. On June 10, 1882, the estate of Martha S. Parker, which held a mortgage on 10 Gloucester, foreclosed and sold the property to John Lathrop. He and his wife, Eliza D. (Parker) Webster Lathrop, made it their home. They previously had lived at 3 Brimmer. They also maintained a home in Dedham. John Lathrop was a lawyer and, in 1874, became Reporter of Decisions of the Supreme Judicial Court. He remained in that position until 1888, when he was appointed a Justice of the Superior Court. In 1891, he was named to the Supreme Judicial Court, a position he continued to hold until his retirement in September of 1906. Living with the Lathrops from 1900, and possibly before, was Edward Stanley (called Stanley) Webster, an automobile mechanic and dealer. He was Eliza Lathrop’s grandson, the son of Edward C. Webster (the son of Eliza Lathrop and her first husband, Ralph C. Webster) and his wife, Dorothy A. (Dodge) Webster. Eliza Lathrop died in July of 1903. John Lathrop continued to live at 10 Gloucester. Stanley Webster had moved and was living in Winthrop in August of 1906 at the time of his marriage to Minnie Mildred Perry. By 1908, they had were living at 10 Gloucester with John Lathrop. They continued to live with him in 1910. 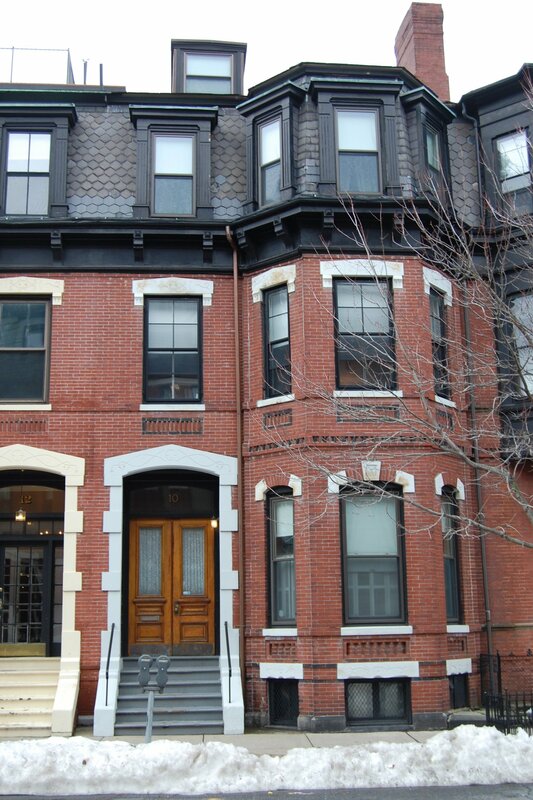 John Lathrop continued to live at 10 Gloucester until his death in August of 1910. After his death, the Websters moved back to Winthrop. The house was not listed in the 1911 Boston Blue Book. On December 15, 1910, 10 Gloucester was purchased from John Lathrop’s estate by attorney Edmund Kent Arnold. He and his wife, Luenna Pearl (Butler) Arnold, lived at 12 Gloucester. On August 16, 1911, 10 Gloucester was acquired from Edmund Arnold by Miss Marjorie Crane Appleton. She continued to live there until her death in November of 1913. In her will, Marjorie Appleton left 10 Gloucester to her brother-in-law, Rev. George Francis Weld, husband of her sister, Dorothy Everard (Appleton) Weld, noting that it was his financial assistance that made it possible for her to purchase the house. The Welds lived in Santa Barbara, California, where he was rector of All Saints-by-the Sea Episcopal Church in Montecito. He leased 10 Gloucester to others. By the 1914-1915 winter season, 10 Gloucester was the home Dr. William Henry Smith. He was an instructor at Harvard Medical School and a physician. He maintained his medical offices at 10 Gloucester with Dr. Robert Battey Greenough, also a physician and surgeon, and an assistant professor at Harvard Medical School. William Smith previously had lived at 377 Beacon as a lodger with Robert Greenough and his wife, Amelia (Goodwin) Greenough. Dr. Smith and Dr. Greenough also had maintained their offices there. 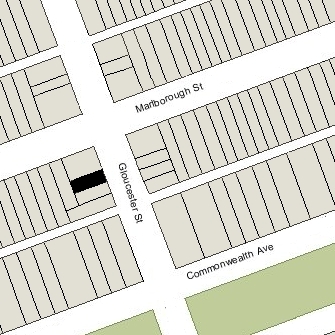 The Greenoughs had moved to Brookline at the same time as William Smith moved to 10 Gloucester. 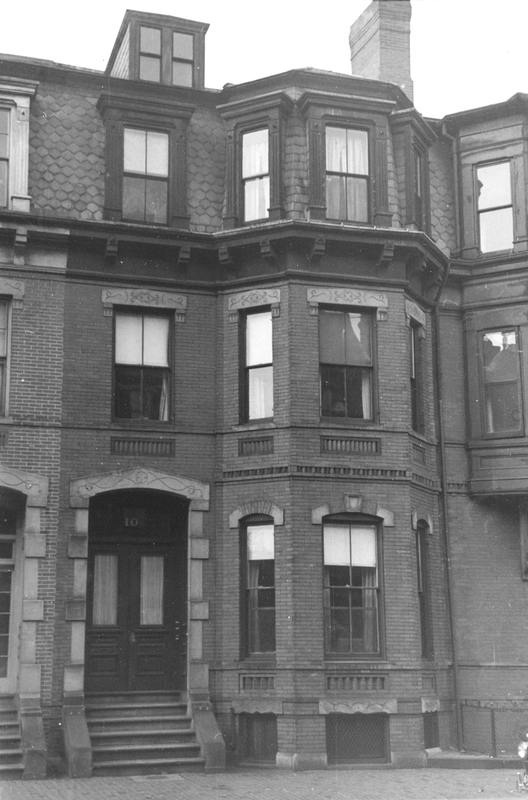 Dr. Smith continued to live at 10 Gloucester during the 1916-1917 season, after which he moved to Brookline to live with the Greenoughs. By 1920, both doctors maintained their offices at 8 Marlborough. In about 1923, Dr. Smith moved his residence to 379 Beacon. By the 1917-1918 winter season, 10 Gloucester was the home of stockbroker Rufus Lentner Sewall and his wife, Juanita (Hewitt) Sewall. They previously had lived in Nahant. He died in February of 1919. Juanita Sewall continued to live at 10 Gloucester during the 1919-1920 season, but moved thereafter. During the 1920-1921 winter season, 10 Gloucester was the home of Cleveland Bigelow, a cotton broker, and his wife, Frances Constance (Folsom) Bigelow. They also maintained a home in Cohasset. Cleveland Bigelow was the nephew of Albert Smith Bigelow, who had lived at 10 Gloucester soon after it was built. By the 1921-1922 winter season, they had moved to 385 Marlborough. During the 1921-1922 winter season, 10 Gloucester was the home of Gertrude May (Hood) Park, the widow of John Francis Park, and their daughter, Annabel Park. In 1920, they had lived at 509 Audubon Road. By 1923, they had moved to an apartment at 330 Dartmouth, and by 1924 they were living at 1 Exeter. On April 12, 1922, 10 Gloucester was purchased from George F. Weld by Grace E. (Freeman) Gray, the wife of James Cunningham Gray. They previously had lived in an apartment at 259 Beacon. James Gray was an interior decorator. Grace Freeman had been a noted musical comedy actress who appeared in productions on Broadway as well as in Boston. They had married in January of 1903, during her appearance in Boston as the lead player in “A Country Girl.” In 1914, he had authored a musical comedy, “Phyllis,” featuring her; the play closed soon after it opened in Boston. By the 1923-1924 season, the Grays had moved to an apartment at 421 Marlborough. On May 16, 1923, 10 Gloucester was purchased from Grace Gray by Amey Dexter (Sharpe) Peters, the wife of architect William York Peters. They lived at 143 Bay State Road. In June of 1923, William York Peters applied for (and subsequently received) permission to remodel the interior of the house. 10 Gloucester became the home of the Peters’s son-in-law and daughter, Harold Amory and Amey (Peters) Amory, who married that year. They also maintained a home in Nahant. He was a cotton broker. On June 28, 1927, Amey Peters transferred 10 Gloucester to Amey Amory. In September of 1930, Harold Amory applied for (and subsequently received) permission to enclose a dormer in the rear roof. The Amorys continued to live at 10 Gloucester until 1932, when they moved to Dover, Massachusetts. Amey Amory continued to own 10 Gloucester and lease it to others. The house was not listed in the 1933 Blue Book and was shown as vacant in the 1934 City Directory. By 1935, 10 Gloucester was the home of George E. Harrington, a real estate agent, and his mother, Marion P. (Starr) Harrington, the widow of George E. Harrington. They previously had lived in an apartment at 295 Beacon. They continued to live at 10 Gloucester until about 1937. 30 Gloucester was shown as vacant in the 1938 City Directory. On April 5, 1938, the Institution for Savings in Roxbury and its Vicinity foreclosed on a mortgage it held on 10 Gloucester and took possession of the property. On June 18, 1938, 10 Gloucester was acquired from the bank by Miss Charlotte Louise Brady. She lived at 10 Gloucester with her unmarried sisters, Frances and Kathleen, and their mother, Alice M. (Hennessey) Brady, the widow of Henry P. Brady. They previously had lived at 477 Commonwealth. Alice Brady died in August of 1940 and the Brady sisters moved soon thereafter. Charlotte Brady continued to own 10 Gloucester and lease it to others. By the early 1940s, 10 Gloucester had become a multiple dwelling, either apartments or a lodging house. Among the residents from about 1941 through 1943 was Mrs. Anna Hall (Morrill) Parkhurst, the widow of Daniel Burleigh Parkhurst. He had been a physician, artist, and author. They previously had been lodgers at 294 Commonwealth; he had died in December of 1938 while they were living there. By 1944, Lester Bottomley, a wool salesman, and his wife, Hilda (Westall) McGowan Bottomley, where living at 10 Gloucester. They previously had lived in Needham. Among the other residents from about 1944 was Frank Farrington Stevens, a real estate broker, who also previously had lived in Needham. On January 12, 1945, 10 Gloucester was purchased from Charlotte Brady by David James Lynch and his wife, Frances J. (Barry) Lynch. They previously had lived in Rhode Island. He was a salesman with the Sealright Company. 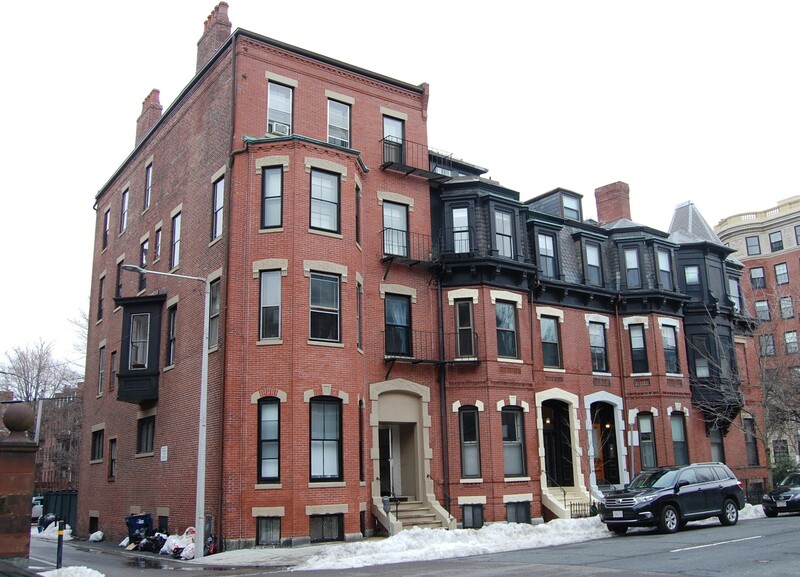 They lived at 10 Gloucester along with the Bottomleys, Frank Stevens, and other residents. The Lynches had moved to Wellesley Hills by 1946. On December 17, 1945, 10 Gloucester was purchased from the Lynches by Jane Elizabeth Kickham, a stenographer. She lived in Brookline. On July 8, 1946, 10 Gloucester was purchased from Jane Kickham by Philip McMorrow, Jr., an insurance and real estate broker in partnership with his father. He lived at 6 Keswick with his parents, Philip McMorrow, Sr., and Grace V. (Cahill) McMorrow, both of whom died in October of 1946. Lester and Hilda Bottomley and Frank Stevens had continued to live at 10 Gloucester, and on September 2, 1948, they purchased the house from Philip Morrow, Jr.
Lester Bottomley died in June of 1962. Hilda Bottomley and Frank Stevens continued to live at 10 Gloucester until about 1966 (he died in August of 1966 in Plymouth). On April 28, 1966, 10 Gloucester was purchased from Frank Stevens and Hilda Bottomley by Ralph August Kulberg and his wife, Wendy (Tourtellot) Kulberg. They previously had lived in an apartment at 4 Gloucester. He was personnel manager for Dewey & Almy, chemical manufacturers, a subsidiary of W. R. Grace & Co.
On September 30, 1974, 10 Gloucester was purchased from the Kulbergs by Herbert J. Huebsch and his wife, Deborah A. Huebsch. In October of 1974, they applied for (and subsequently received) permission to convert the property into three apartments. The property changed hands. It remained assessed a three-family dwelling in 2017.